Submitted by portlandpiper on Thu, 2007-04-12 00:09. I did not get my bunny until Easter, so you did not get the review until I finished it. 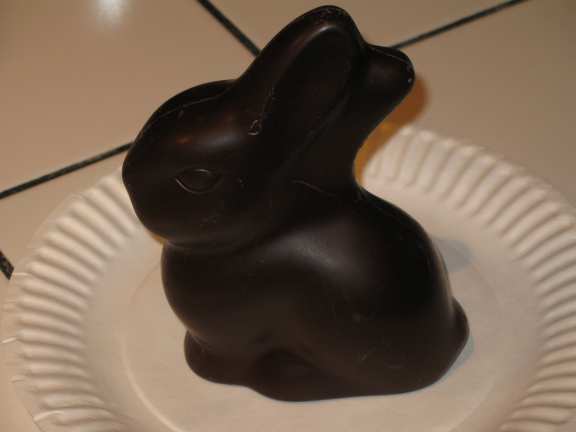 If you are getting a bunny for a chocolate lover, this one is pretty darn good. It really should get an 8.8, but I rounded it up to a 9 because the rating system only had whole numbers. 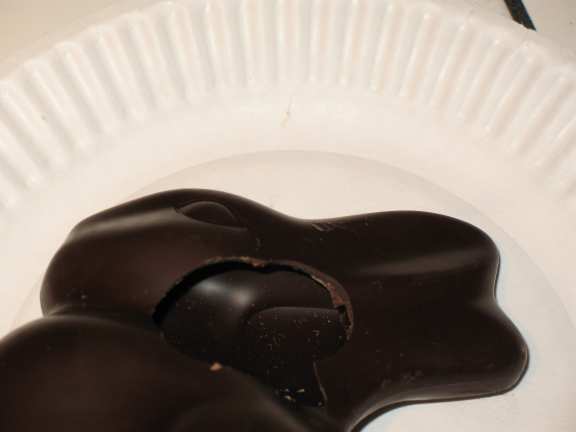 This bunny is Lindt chocolate. Smooth texture. Rich and full flavoured. Nice snap when you bite into it and the aroma fills the mouth and nose as it melts in your mouth. Three things would make this a better bunny for me. 1) Make it bittersweet. Dark chocolate is very good, but I would have given it a 9.8 if it were bittersweet. This is hard to see, but the ears are hollow. Most of the bunny is about 1/8" to 1/4" thick. It does get to about 1/2" thick at the tight corners. Here you can see that there is not much detail on the bunny. Submitted by subitulibro on Thu, 2007-11-01 06:31. First I want to thanks this page, it´s very complete it and very very good page, I see and use a lot of things from this page. I want to ask you where can I find more info of Chocolate ? Submitted by portlandpiper on Thu, 2007-11-01 10:09. Sorry, your question is a little too vague. For professional baking techniques and recipes I use The Professional Pastry Chef. For treats for home and small parties I use the "Death By Chocolate" series of books by Marcel Desaulniers. If you had a different chocolate question that is not answered by the questions above, please try clarifying or rephrasing your question.